Wintertime is the best time of year to bake! It’s cold outside, their are friends and family to spend time with, and lots of treats to try out. With these healthy holiday recipes, you’re sure to find something you’ll love that won’t harm your diet. We recently published an article with many great substitutions for making your baking more healthy. If you haven’t had a chance to read it yet, be sure to give it a look before diving into your next batch of cookies! Before we jump into several healthy holiday recipes, here are a few ideas left out of that article. Reduce the Butter: Some unusual baking ingredients like fruit juice, nonfat buttermilk or even nonfat yogurt can be used as a partial replacement for some of the butter. Using a wet ingredient such as these ensures that your cookies won’t be too dry. For a good balance, use 2 to 4 tbs of liquid ingredient in exchange of 4 tablespoons butter. Fiber Boost: In our earlier baking article, we recommended using more whole wheat flour in exchange for the refined white flour typical of most baking recipes. For an even greater change (and unique flavor! ), use 1/4 to 1/2 cup of “all-purpose flour” mixed with whole rolled oats or oat flour. If oats aren’t your thing, flaxmeal or ground flaxseeds will add fiber, too. Also, flaxseeds are great for cardiovascular health due to the prevalence of the omega-3 fatty acid, alpha-linolenic acid (ALA). Use 2 to 4 tablespoons of ground flaxseeds in your next batch of cookies. This Cranberry-Nut Chocolate Chip recipe from cooking light is a sweet and tangy treat. In addition to being mouth-watering, these cookies are also low in calories. Each cookie will set you back just 75 calories. The average chocolate chip cookie will weight in at 210 calories! Many of us can’t imagine Christmas without a slice of Christmas Fruitcake. This high-sugar dessert can derail your diet. If fruitcake is an important part of your Christmas tradition, we suggest you try this Paleo Fruitcake Recipe from Elena’s Pantry. This yummy recipe swaps out butter for healthier coconut oil and uses real dried fruit instead of high-sugar candied fruit. 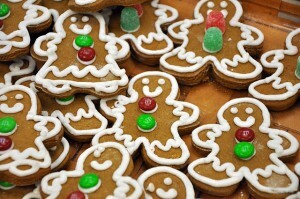 Whether you are building a house or making tiny men, gingerbread is a delicious and fun way to celebrate the season. Teresa Cutter’s recipe for healthy ginger men has all of the spice and flavor without using unhealthy ingredients. Teresa uses dates and honey in place of refined sugar and uses olive oil in place of butter. Baking is a part of our holiday tradition, but it puts us in danger of gaining weight. Fortunately, there are plenty of ways to create and enjoy our most celebrated treats without using unhealthy ingredients. All you need is some creativity and awareness! This holiday season enjoy holiday treats that are actually good for you and your family! So you can start off the New Year feeling good about your health!